What is sweeter than your own personalized lcandy? For corporate promotions, wedding favors, anniversary & graduation table gifts these bite-sized pieces of candy make a big statement. What will your candy say? This simple clear bag displays your lcandies beautifully. The 3x5" bag is sealed air tight and holds approx. 78g or about 20 pieces. Click here to go back to all packaging options. There is a minimum order due to the nature of making the personalized candy, and is equal to about 22 lbs. of candy. 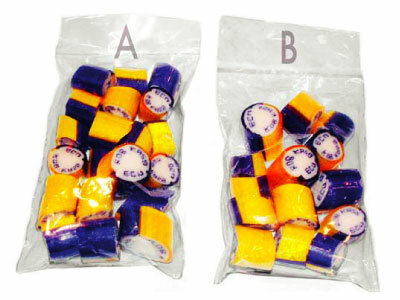 For a slightly smaller amount in each bag, check out Standard Bag B (65g) Packaging.